Restored 1960 Eldorado Brougham for sale exclusively from Deco Rides! Truly the last of the hand crafted Cadillacs, only 905 Eldorado Broughams were built from 1957 through 1960. Inspired by the Eldorado Brougham dream car of 1955, from the outset they were conceived, developed and carefully custom-crafted with but one objective in mind ... to provide the finest limited-production luxury motor car possible for the world's most discriminating motorists. Where the more common stainless steel roof 1957-‘58 Broughams were built in the United States, the scarce second generation 1959-‘60 models were designed at the Cadillac Studios in Warren, MI . Their component parts were were all built in Detroit and subsequently crated and shipped to the reknowned Pinin Farina workshops. The Cadillac chassis and other usable hardware were delivered to Genoa, Italy (located about 100 miles west of Turin). There, the bodies were hand-built and mounted in the new Via Lesna industrial complex. Pininfarina dealt with fabricating, assembling, fitting and finishing each body. Of the 400 1957 and 304 1958 Eldorado Broughams built, only 244 1957 and 183 1958 Broughams remain. The others were scrapped or stripped as parts car. Even rarer, the 1959 production totaled only 99 units while those of 1960 numbered 101. An unconfirmed rumor has it that one of the 1959 chassis was dropped in the harbor at Detroit, during loading operations for Italy, which may explain why Farina built one extra unit for 1960 Production figures. Only 40 of the 1959 models and 54 of the rare 1960 Eldorado Broughams remain. More refined than the wild bodywork of the production 1959 and1960 Cadillacs, the 1960 Italian Brougham has a distinctive style of its own. A new rear deck, very thin roof line and huge compound curve 3 foot tall windshield set it aside from the production models. A second fin or "skeg" runs from just behind the front wheel opening and extends downward, at an angle of about 45 degrees, level with the center of the wheel hubs. This was a very stylish complement to the upper, restrained tail-fin. 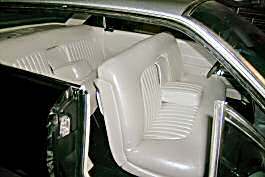 The new, so-called flare molding, became a feature of standard Cadillac models in 1961 and 1962. The reknowned Pinin Farina workmanship includes sheet metal that was cut and formed on male wooden forms then welded together. Seams were hammer welded without the use of solder and were filled with lead, harkening to the great coach builders of the 1920's and 30's. 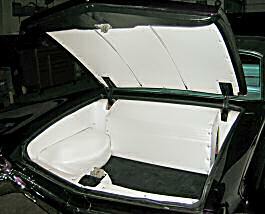 The hood, trunk and doors all fit perfectly and tolerances along the panel edges do not vary a fraction of an inch. Chrome trim is made from brass castings, and every piece is custom made and hand numbered for each car. The forward-opening hood was an exclusive design. Other unique features of the Brougham include the small quarter-window which automatically recedes when the corresponding rear door is opened. It also had one of the first automatic power trunk closing mechanisms. The limited production hand built 1957-‘60 Eldorado Broughams cost Cadillac $25,000 each, and sold for $14,000, about twice as much a the highest priced production Cadillac model of that era, and more than most new Rolls Royces. With 50 years of inflation, in today's dollars, that $14,000 price tag is equivalent to about $400,000. Only a very wealthy few owned Eldorado Broughams such as Middle-East potentates like the Emir of Qatar, media moguls like Randolph Hearst, industry giants like the CEO's of Dow Chemical and Huckins Yacht Co., shipping magnates like Aristotle Onassis, and Hollywood stars of the ilk of Clark Gable, Bob Hope, Frank Sinatra and John Wayne. James Tate, the Mayor of Philadelphia, was the original owner of the 1960 Brougham #51 presented here. Terry Cook of DECO RIDES in Long Valley, NJ acquired the car from Fred Kanter after he wisely kept it in storage for 30 years, preserving it from the elements. 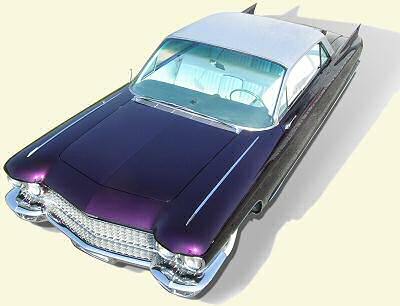 To begin the restoration, the car was stripped to bare metal and lovingly restored with a pearlescent purple body and contrasting silver roof. All exterior chrome save the windshield frame was stripped and replated. A set of rare polished Cadillac Turbine wheels were shod with new wide white radial tires. The complete interior was redone in Italian white vinyl. A pair of rare 1958 Brougham sun visors were added for a custom touch. This car was painstakingly refurbished from the radiator and hoses to the gas tank. This includes new brakes, brake wheel cylinders, brake hoses, ball joints, tie rod ends, idler arm, steering box, neutral safety switch, exhaust system, air conditioning compressor, door and trunk weather stripping, AC dryer, water pump, flushed fuel lines, and more. The original air bag suspension had deteriorated so it was completely replaced with a modern system from Air Ride Technologies, with the controls hidden in the ash tray. The door handles were removed and smoothed but were saved and are included with the car, if the new owner wishes to replace them. 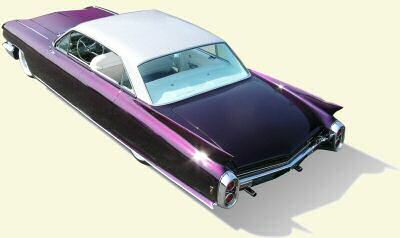 No other exterior custom body modifications were made and the styling of the car is faithful to the original. 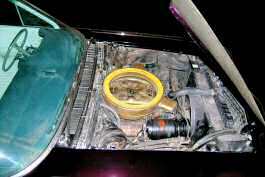 The original Brougham engine remains in the car. The triple-carbureted 390 cubic inch V-8, was advertised as producing 345 hp at 4800 rpm. Distinguishing marks of the last of the elegant Brougham models include an oblong plaque mounted on the rear quarter panel with a red cloisonné inner area. During restoration of this car, a number of these emblems had to be recreated, and an extra pair resides in the box in the trunk which also contains the original air bags, the original door handles, original sun visors and the service manual for this car. Credit for transforming this "warehouse fresh" Caddy goes to three shops. Harvey Bagshaw at Starlite Auto Body in Mattituck, NY, with special assistance from Dan Baione and Sam Miller, took delivery of the bare metal car from Pro Blast in Milton, DE. They performed the necessary bodywork and prep for paint, then applied the color. In case you are not familiar with them, Bagshaw and Starlight have an impeccable reputation for building incredibly perfect cars. Bobby Sapp of Sapp's Auto Interiors of Milford, installed the trim. The major work of disassembly, going through the car from radiator to gas cap, and subsequent reassembly goes to Ramsey Mosher and Matt Polasko of Ram's Rod Shop in Dover, DE. For more information and to find out when and where you can see this vehicle, email Deco Rides.